On Women’s Day, I was thinking about Nasim who lost her beautiful face this year; thinking about all those innocent women whose beautiful faces were burnt due to the acid attacks carried out state agents; my fellow women who are imprisoned for mal-veiling. I was reminiscing about Reyhaneh who was executed because her only crime was to defend herself from being raped by an intelligence services’ agent. Acid attacks and stabbing women are only a few of Khomeini’s mandatory verdicts since he came to power 36 years ago. It is important to mention that his verdicts have not been left unanswered and are being constantly resisted by free Iranian women. Pouring acid on women is not done by street criminals; it is being committed by the Basij and regime’s Guards Corps (IRGC). The Iranian regime not only has turned a blind eye on this matter, but the regime’s parliament has now passed a law in which these criminals are given immunity. The Iranian regime is dictatorial, inhumane, and brutal and there is no place for them in a civilized world. The pain and suffering that these mullahs have brought through aggression and by creating inequalities, especially in order to oppress women, are endless. The rules set by reactionary mullahs are motivated by controlling the fates of women via imprisonment and ending lives through various death sentences such as stoning and hanging. I was thinking about women’s situation and remembering all the crimes committed by the mullahs that I found myself busy with the thought of how we can gain women’s rights. I had many questions in mind. Will their voices ever reach out somewhere? Is there anybody that will answer their cries? What is the solution? Where can we find an answer? All of a sudden, I received a message on Facebook from a friend of mine. She told me to tune into Simay-e-Azadi’s channel to watch their program for the 8th of March, Women’s Day. I watched the whole program at home. It was there and then that I found the answers to my questions and a light of hope sparkled in me. I felt as if I were one of the thousands of Iranians sitting in that meeting. I could sense and comprehend every word in Mrs. Maryam Rajavi’s speech regarding the mullah’s dictatorship. Yes, she is the voice and the savior of Iranian women. 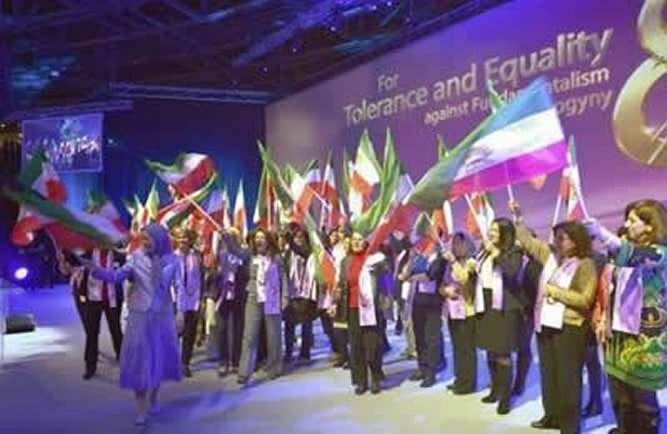 A woman in exile, who has been fighting against the ruling fundamentalist regime, has gathered prominent political personalities in Berlin from all over the world on women’s day in support of women against misogynist mullahs. Yes, someone is coming, someone who is not like anyone else; yes, the sun shall dawn. By listening to the speech of Mrs. Rajavi, I was confident that against the monstrous mullah’s regime ruling in Iran, a combatant force (PMOI), organized and popular as they are, represents a democratic and tolerant Islam in which equality between men and women are promoted. With no doubt, this is a holy gift to all Iranian women and even to the rest of the women all over the world. This combatant force along with 1000 heroic women who are in Liberty are the source of hope and power to fight and resist against the violations and extremism in Iran and all the countries where women are suffering from sexual segregation and misogyny. The main solution is a tolerant and democratic Islam, the anti-dissertation of religious fundamentalism led by Maryam Rajavi. Yes, Maryam Rajavi’s message that, ‘women are the force for change’, serves as an inspiration to me and all my compatriot women. We must fight against many obstacles and we must not give up against the mullahs. We have to move forward… For Iranian women and all the women in the region, this is the time to displace disappointment with hope. Now is the time to transform our anger into the motivation for change. We must make changes and replace sorrow and dejection with new energies for moving forward and overthrowing this misogynist mullah’s regime.